2-2-2-2- Hispanic Employment Program Hispanics constitute 1.6 percent of the total RIA installation workforce. Hispanics are underrepresented in grade levels GS-11 and above and in WG-12 and above. And they are not represented as WL/WS. In order to improve the employment situation of Hispanics we need to first examine some the differences cultural and social problems to increase our understanding of the Hispanic and brige some of the prjudices and discrimination which make it difficult for the Hispanic to enter the economic mazinstream. 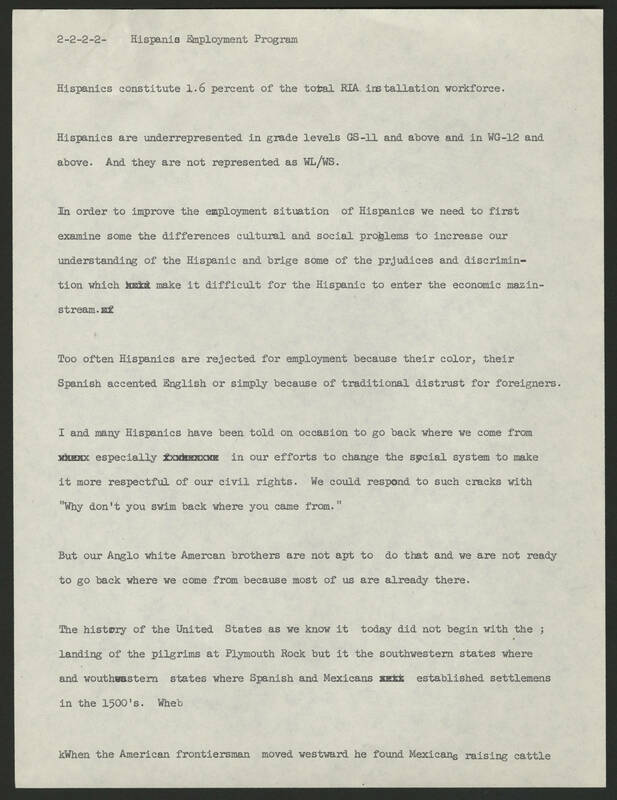 Too often Hispanics are rejected from employment because their color, their Spanish accented English or simply because of traditional distrust of foreigners. I and many Hispanics have been told on occasion to go back where we come from especially in our efforts to change the social system to make it more respectful of our civil rights. We could respond to such cracks with " Why don't you swim back where you came from." But our Anglo white Amercan brothers are not apt to do that and we are not ready to go back where we come from because most us are already there. The history of the United States as we know it today did not begin with the ; landing of pilgrims at Plymouth Rock but it the southwestern states where southwestern states where Spanish and Mexicans established settlemens in 1500's. wheb When the American frontiersman moved westward he found Mexicans raising cattle.